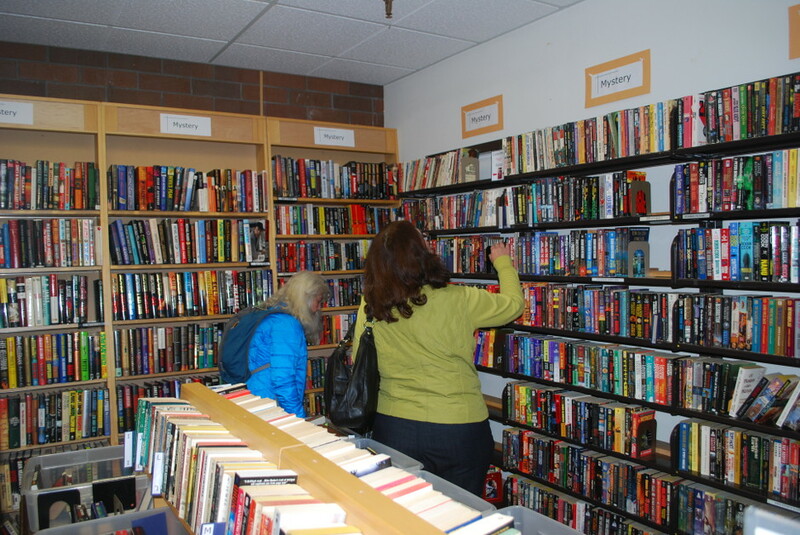 Most volunteer positions at the Booktique fall into three categories: sorter, pricer and cashier. All positions require some knowledge of books, sufficient physical strength and dexterity to handle books, and the ability to get along with other book-lovers in tight spaces: our workroom space is small! Sorting is physical and mental work: on your feet, lifting bags and boxes of books, inspecting, and deciding what to keep and where to store it for the next step. Strength, stamina, and knowledge of all genres of books are required. Pricing is more of a specialty: pricers follow store guidelines to mark books with our price and then shelve them in the correct location in the store. Pricers usually specialize: fiction, non-fiction, children’s or some other category. Pricers sit part of the time but also walk back and forth with books, bending and reaching to shelve them where they need to be. Cashiering requires public relations skills as well as the confidence to operate the cash register and credit card machine. Cashiers sit much of the time, but also walk around to greet customers and help them find books. Training is provided for all positions. Most volunteers work a 3-hour shift the same day each week, either 10 to 1 or 1 to 4. In addition we can use substitutes who are available to fill in when regular volunteers are absent. Substitutes must go through training and then sub often enough to keep up their Booktique skills. We also sometimes need a driver to transport books from the library to the Booktique: vehicle with space for 6-24 boxes and a strong back are required for this on-call position. If you are interested in volunteering, visit the store and contact the store manager, Margaret Ogren at 503-699-6109.